Hispanic male in his mid 30s who presented to the ED as John Doe after he was found unresponsive in the field with cardiac arrest. Unknown downtime. As per EMS endorsement from bystanders, the patient allegedly had a witnessed syncopal episode followed by seizure-like activity after which he became unresponsive. No bystander CPR. EMS arrived at the scene and found him pulseless, CPR started. On ALS arrival patient found to be in PEA. CPR, intubated, epi x 2, bicarb then ROSC achieved. 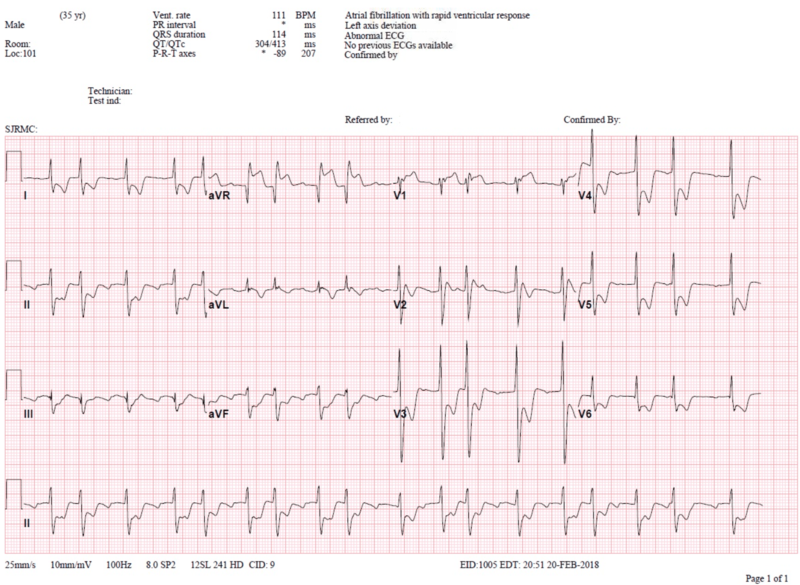 Initial rhythm in ED was sinus tach on monitor. After 5 min in ED patient became bradycardic and went into PEA, compressions started, received epi x 1 w ROSC. Pt then went into wide complex tachycardia on monitor – SVT vs Vtach – pt was cardioverted 200J and given Amiodarone 150mg. Post cardioversion, rhythm changed to afib v aflutter. EKG was obtained after 10 min (below). ABG done on patient arrival = 6.80/86/253/14; Na+ 133; K+ 4.4, Ca++ 1.04; Glu 246, Lac 8.8, BE -10.2 These were the only labs available at the time of admission. Case d/w Cardio fellow who came to evaluate pt at bedside, decision made to transfer pt directly to cath lab. 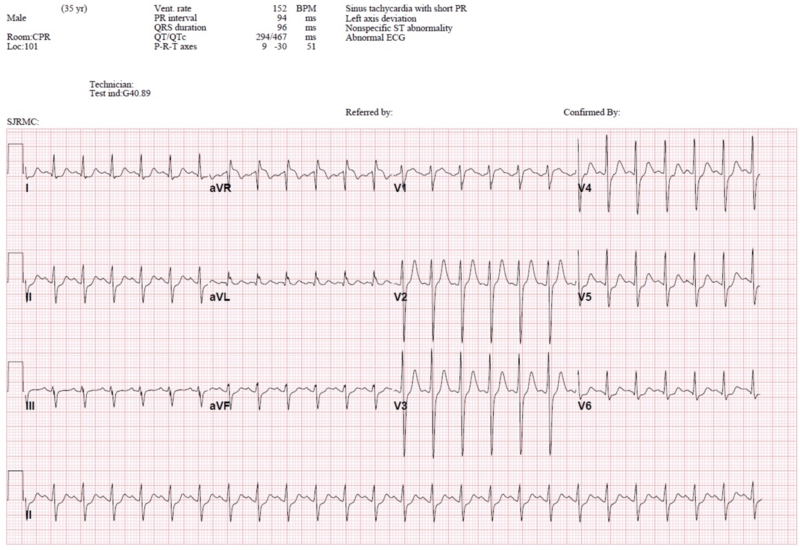 EKG was repeated after 5 minutes prior to patient being transferred, which is shown below. Interventional cardiologist advised immediate transfer to cath lab for diagnostic cath (did not want to wait for CT Head). Cath showed normal coronaries with LVEF 75%. Patient transferred to the CCU post cath. He was noted to have no brainstem reflexes off sedation. CT Head showed findings c/w anoxic encephalopathy, no bleed. Neuro was consulted who stated patient’s exams and further diagnostic studies were significant for loss of all cortical and brain stem function, consistent with brain death. Patient was pronounced on Day 10 (delay with identifying patient and determining NOK). Is ST-Segment Elevation in Lead aVR Getting Too Much Respect? ECG reading is all about pattern recognition. And this particular pattern of ST-Elevation in aVR with diffuse ST Depression is a very important ECG pattern that you must be able to recognize. But what’s probably more important than being able to recognize the pattern, is understanding what it represents. There appears to be a common misconception that the ST-Elevation in aVR always represents “STEMI”, or acute transmural (full- thickness) ischemia. If this were the case the patient would most likely be dead or at the very least in profound cardiogenic shock. The key to understanding what this pattern represents lies in understanding that the ST-Elevation in aVR is reciprocal to the diffuse ST-Depression – and that this diffuse ST-Depression represents global subendocardial ischemia. So the real question that you must answer is: What is causing the global subendocardial ischemia? It is critical to realize that more often than not the cause is global myocardial strain from a Non-ACS etiology! (profound sepsis, tachycardia, anemia, hypoxemia, etc). In our patient above it may have been because of the SVT he was in during the code in addition to being in Afib w/ RVR at the time of the ECG. It is also very important to understand that in these Non-ACS settings, you can see this pattern with or without underlying coronary artery disease. But of course it could be ACS. And if it is, then you are dealing with Left Main, Proximal LAD, or even multi-vessel plaque instability. But keep in mind that even if it is ACS you are still dealing with subendocardial and not transmural ischemia. Patients with ACS due to LMCA Blockage, Triple Vessel Disease, or Proximal LAD Blockage will look “sick” due to global cardiac ischemia. This narrows the number of patients we would consider activating the cath lab for with STE in aVR. The key to ECG reading is pattern recognition. The pattern of ST-Elevation of at least 1mm in lead aVR + diffuse ST-Depression with a maximal depression vector towards leads II & V5 is a pattern you must know. It represents global subendocardial ischemia. When you see this pattern you should divide the differential for the diffuse subendocardial ischemia into two main categories: ACS vs Non-ACS. Do not automatically assume that it is ACS. I have seen this mistake made many times as ACS becomes the focus, at the expense of appropriate resuscitation addressing the underlying cause. It is very important to keep in mind that the etiology is far more likely to be Non-ACS than ACS! The key to determining the etiology is through history, physical exam, clinical picture, laboratory data, Echo, and vigilant monitoring and frequent reassessment. If you have identified and addressed potentially reversible causes of the ischemia, and the ECG pattern persists then you are dealing with ACS until proven otherwise. Refrain from using dual-antiplatelet therapy in these patients as there is a high likelihood they will require CABG. Remember that if this ECG pattern does represent ACS, the ST-Elevation in aVR is not the result of direct injury (or transmural ischemia) and that the ST-Elevation in aVR is reciprocal to the diffuse ST-Depression. Therefore these ACS cases do not represent a clear “STEMI”. However, while there is not great data to guide the timing of cath for these patients, I would advocate going to the cath lab with a much stronger sense of urgency than for other “NSTEMIs”. The reasoning is that ACS is a very dynamic process and without the advantage of optimal medical therapy (a second platelet inhibitor should be withheld) there is a higher chance of the culprit vessel suddenly occluding and evolving to transmural ischemia. If this happens in the Proximal LAD, Left Main, or in the setting of Multi-vessel involvement the myocardial territory in jeopardy is so large that there is a good chance the patient will arrest and die before any reperfusion can be established! If your patient looks sick or has persistent chest pain, they should be going to the cath lab ASAP.